Musical garners fame for Merivale High School. Natasha Jarrett , left, got the nod for supporting actress at the Cappies gala held at the National Arts Centre on June 10. Her supporting role was in Fame, chosen as the best musical in the city. EMC news – Merivale students are once again in the spotlight for winning the Best Musical Award at this year’s city-wide high school gala. The school – which received the Cappies award for Fame, received the same honour last year for the work The Drowsy Chaperone. Students received honours in five categories – the most of any school nominated. Danielle Denisko won for female dancer; she also won for choreography, along with Chloe Gill. The school also received accolades in the new category of marketing and publicity. Jaelen Truong, Victoria Beales, Ruby Pascoe, Jenna Perclick and Evan Grice were the recipients. Cynthia Wood, the school’s drama teacher, said the students created a 12-episode, behind-the-scenes look at the production accessible on YouTube dubbed Fame Diaries. Natasha Jarrett got the nod for supporting actress. Fame is about talented and diverse high school students struggling with various dilemmas while juggling a rigorous arts training program. Wood said the students’ flexibility and the support of other teachers and parents made the show a success. Gill, a Grade 12 student, joined the show at the last minute as a dancer to take place of another student who had a dance competition. “It was alright, I knew the steps,” she said, adding she has been dancing since she was three years old and wanted to try her hand at being the one to come up with the dances. Gill said she thought she won because the dances worked well without being too complicated for the other students to learn. Wood said the students in the school’s band were an integral part of the production. 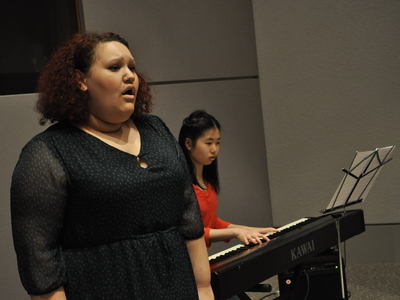 “I have never seen the drama and music departments collaborate so well,” she said. Art teacher Lisa Gale helped out with set design, Elizabeth Dutton worked as musical director and Tessa MacLean and Naomi Watson-Laird worked as vocal coaches. Jaclyn Canas and art department head Irv Osterer helped out with photography and design. The seventh annual Cappies awards were held at the National Arts Centre on June 10. Christine Aman, from Longfields-Davidson Heights, took home a Featured Actress Award for Lucky Stiff.